I had a few of them – the heroic leader Maxx Steele, the villainous Hun-Dred, Coptor and perhaps a few others. They were retro even at the time of their release. They featured accordion-like arms that could “grasp” (or, depending on your point of view, “hug”) when a button was pressed on their backs, and they stood on suction cups. 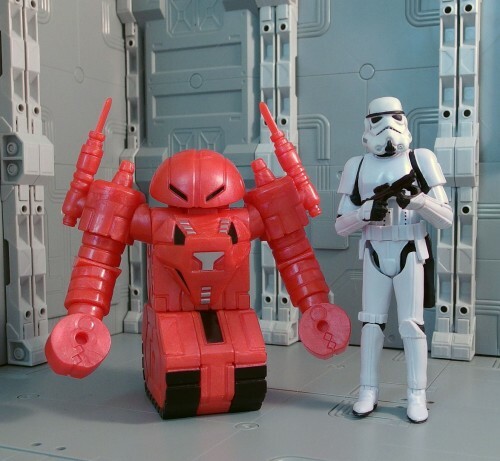 Bizarre features, and like many CBS Toy products (e.g., Manglors), it made the figures rather perishable – it was easy for a kid to break the thin plastic parts holding the arms together and then yank out the accordion-like arms until they were ruined. No doubt many a Robo Force figure was a casualty of sibling rivalry. Nonetheless, the figures had a certain charm that many collectors remembered decades later. One of those collectors was John Kent, a co-founder of the toy website (and now toy company) ToyFinity. 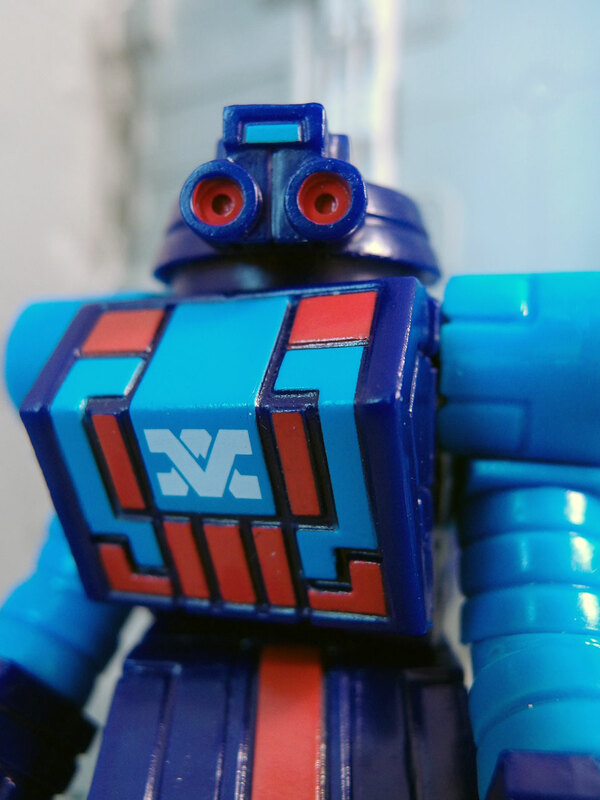 After years of dreaming of bringing Robo Force back and much blood, sweat and toil, John and his partners have joined forces with Matt Doughty of Onell Design to offer collectors a new and innovative way to collect Robo Force. First, some background: like many Onell-related independent toy projects, the initial Robo Force figures are not being released in the same colors as the vintage figures. As I understand it (and I don’t have the whole story), for some characters that will happen eventually, while for others, John and his collaborators are developing a new universe for Maxx and his friends and foes, complete with new looks for some of the characters. To learn more about this new world of Robo Force (which will be part of a shared universe with ToyFinity’s other properties, Manglors and Mordles, as well as Onell’s own Glyos universe), check out ToyFinity’s Robo Force comic, which features some great art by Jerzy Drozd as well as tons of hidden references to other toy lines such as Starriors and Zeroids. The two subjects of this review are “Reforged” Hun-Dred the Conqueror and “Origin” Enemy the Dictator. 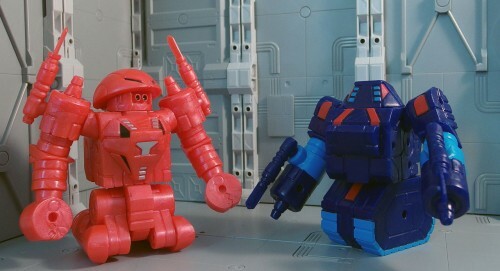 The “Reforged” and “Origin” terms serve two purposes: to reference the specific colorway (red plastic with black and silver highlights for Hun-Dred, dark blue plastic with multiple paint applications for Enemy), and to refer to a plot element or aspect of the character’s backstory that has yet to be explained. This is a common trait of Onell’s Glyos figures; almost every colorway features a prefix that is explained as being related to a story element. 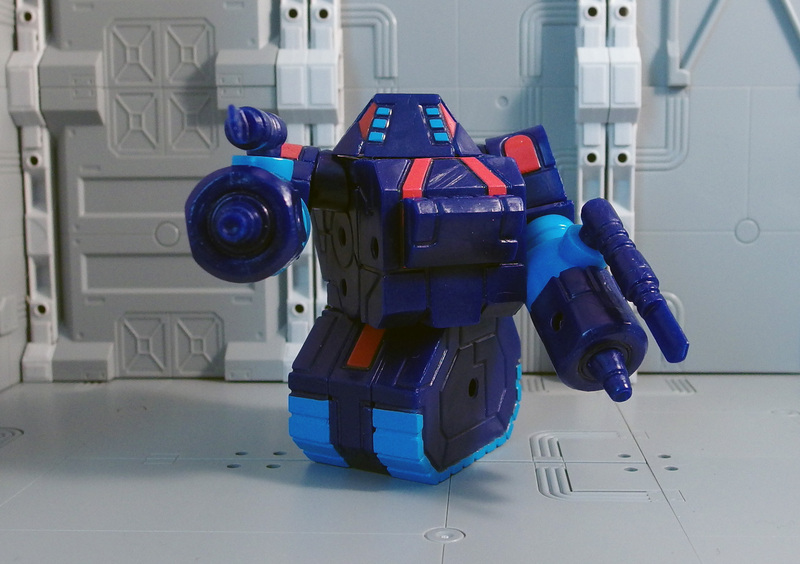 Therefore all those colorways aren’t just repaints or remolds, but in-universe “canonical” designs. 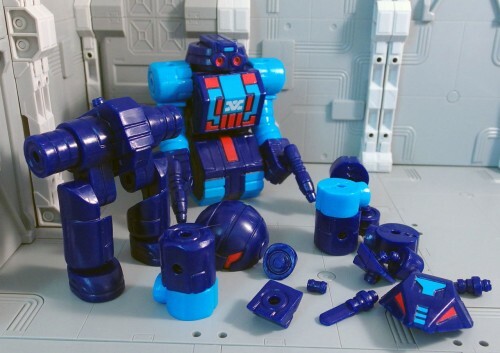 As far as I know, ToyFinity hasn’t yet revealed exactly what the “Reforged” and “Origin” names refer to, though I’d hazard a guess that “Origin” is intended to represent Enemy’s “original” colors, and that the plain light gray of the vintage toy is a look he gets later on. As for Hun-Dred, who knows? “Reforged” suggests he was rebuilt, so perhaps this is Hun-Dred 2.0. The figures were designed by ToyFinity and Matt Doughty, and Matt did the sculpting. 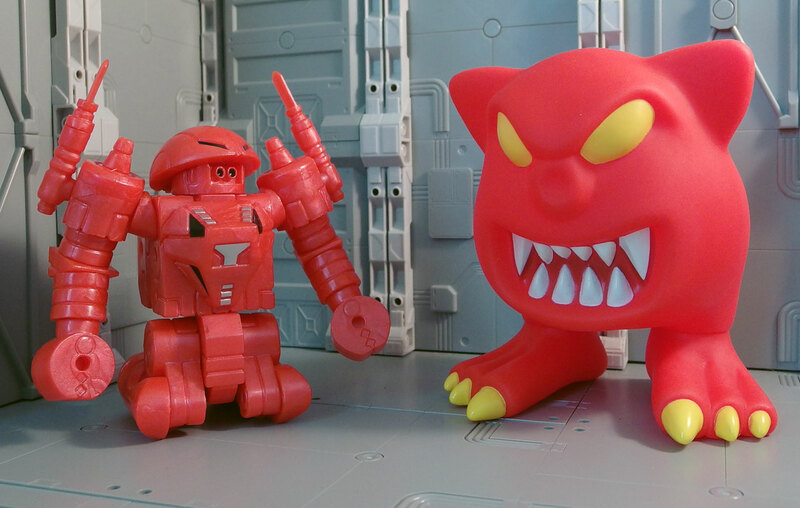 A few key decisions were made here: the scale was reduced by half, presumably (and I’m only guessing here) to make them more in line with the majority of Glyos-compatible toy lines as well as save on plastic costs. The characters themselves were redesigned, with the accordion arms and suction cups being wisely jettisoned in favor of a new feature: interchangeable parts. For the first time, Maxx can walk on two legs! The Hun-Dred set comes with forty-one parts, while Enemy comes with fifty-three(!). There are a lot of intriguing parts included with both sets, many of which – such as some very important wedge-shaped pieces – allow for some creative articulation. 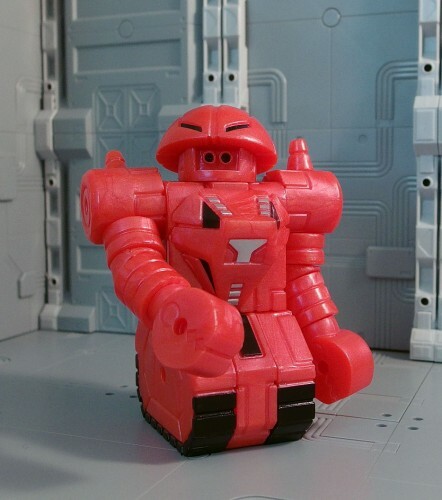 According to Matt, there are a number of secret builds within each figures, and even more when you combine multiple sets – builds of other Robo Force characters and maybe even some Starriors and Zeroids. Unfortunately, there are no directions for any of these – not even the “canonical” builds – which I must admit, drives my OCD-like tendencies crazy. As I’ve often noted, I am not a creative builder. In general, I like things the way they’re “supposed” to look. (I am exactly the kind of person The LEGO Movie says not to be.) And so I tried to make versions of Maxx Steele and Hun-Dred that looked as close to their vintage looks as possible (the Hun-Dred two pics above, not the one below, which is his new look – I think). There are lots of little things I really like about these figures. I like the way Maxx’s eyes aren’t actually part of the main disc of his head, but rather swivel along top of it and can be removed. 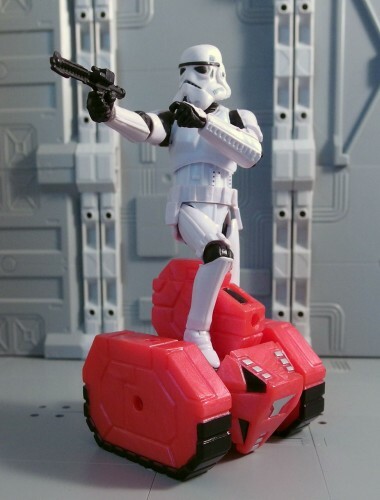 I like the blasters, which are reminiscent of the vintage weapons. I like the segmented arms, and the thick, tough feel of the treads when they’re put together. I like the solution worked out for Hun-Dred’s opening mouth guns, where the angled gun section can be swiveled up or down to reveal the weapons. The figures are made from strong plastic, although a word of warning – some of the Glyos Fit Function joints are very tight. 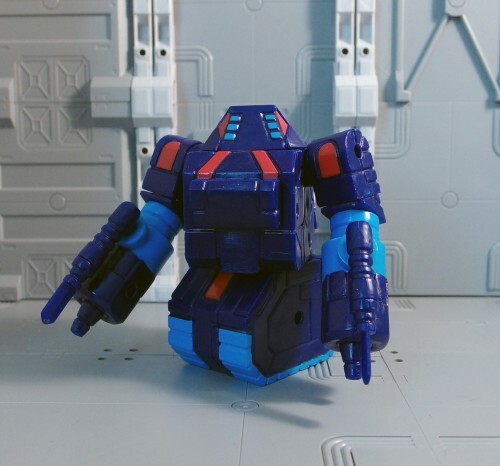 If I have any criticism of these figures, it’s that the Fit Function joints are so tight I think kids would have a really hard time playing with these. I ended up using a small metal wedge from my leatherman to separate a lot of pieces to avoid tearing my fingernails off or bruising my fingertips. The figures have some paint applications as well. 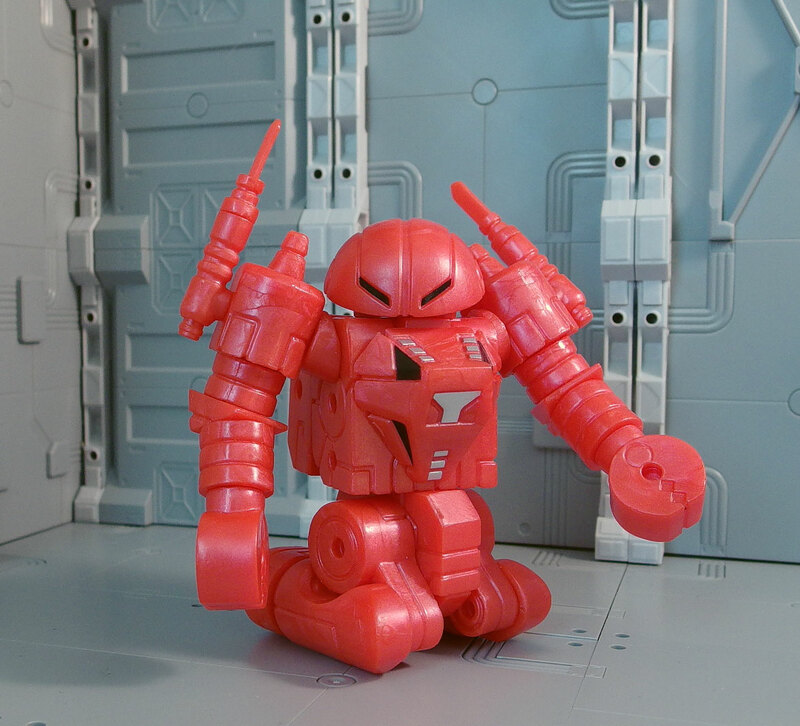 Unlike some earlier Glyos releases, the paint applications here are sharp and look very professional, like something you’d see from the big boys. There’s even a tampograph on the torso that came out fantastic. I’m not sure what it is – given that this is Enemy, I would guess it’s the bad guy symbol, which seems a little odd on Maxx, but remember, I made Maxx out of Enemy. 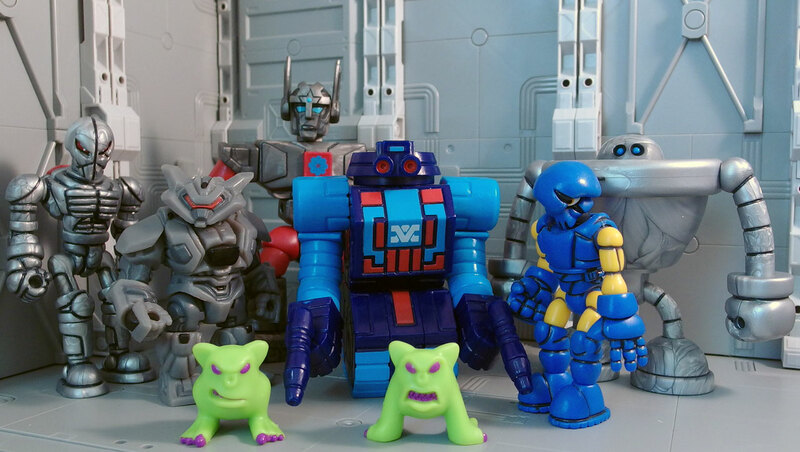 Of course, these figures are that much more valuable if you have other Glyos-compatible figures to swap parts with, such as Onell’s own Glyos, Callgrim, Power Lords, TheGodbeast, Outer Space Men or the Weaponeers of Monkaa. I’ve already seen tons of fantastic builds on the October Toys forums. 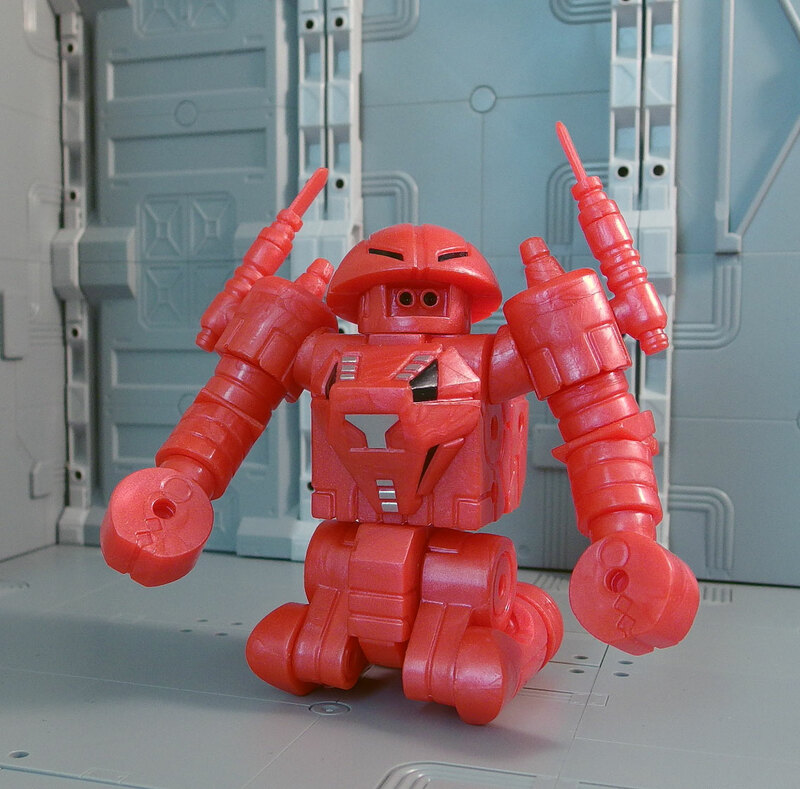 The Robo Force aesthetic fits in perfectly with the Glyos universe at large. The Hun-dred set, with its 41 parts, was sold for $15, while the 53-piece Enemy sold for $18. Given that these are independent toys with small production runs and tons of parts, plus paint applications, I think those are fair prices. Right now these two sets are sold out, but more Robo Force figures are on the way. Keep an eye on the ToyFinity blog and the Robo Force store for the next release. ToyFinity has big plans for the license, including the possibility of finally giving collectors the unreleased second wave of Robo Force, including the mighty Nazgar the Tyrant! Thanks to John Kent for sending these sets for review. I just don't see the appeal here. 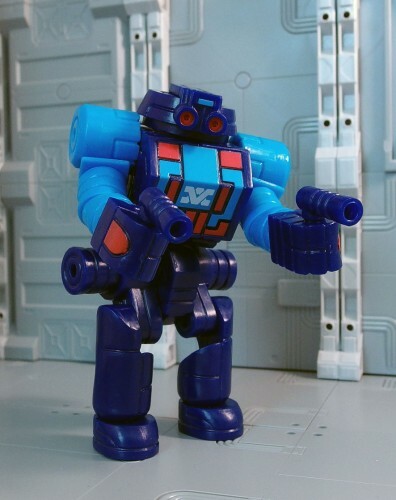 I was mildly intrigued when I heard Robo Force was coming back. But, I mean, to me the charming thing about the originals were the large, chunky size coupled with the accordion arms and other gimmicks. But then I'm not enamored with the low-articulation Gylos figure in general. When I look at MP Transformers, NECA Predators, MOTUC, Tamashii, Retaliation Joes, etc., to spend even $10 on a Gylos or Mordle seems like a waste. But that's just me. I don't find them particularly inviting, either. 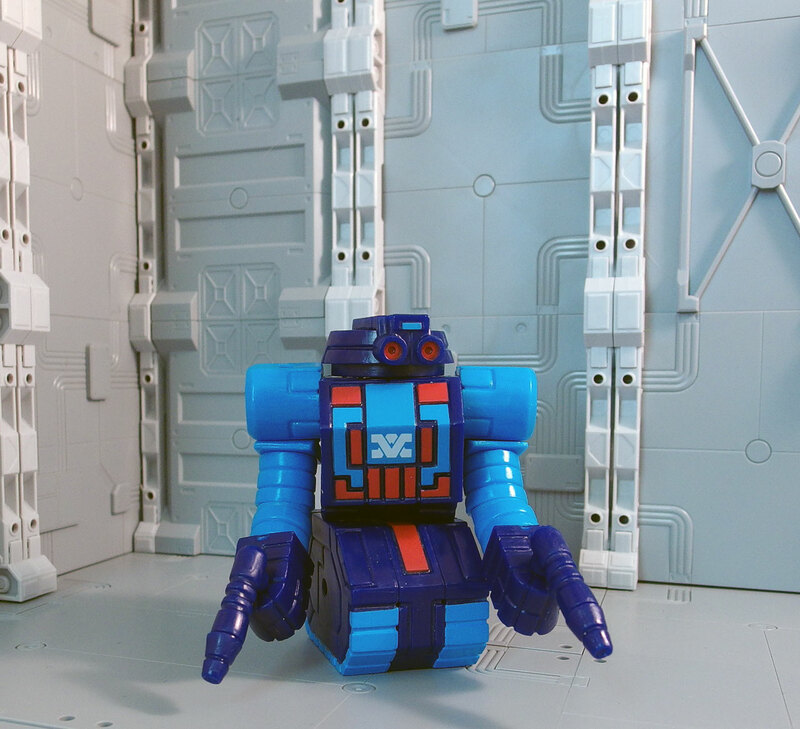 I think I could possibly learn to like them, but it's one of those toys where I'd need to amass a HUGE collection before they'd really be fun, and it's just not worth the initial investment to me. Honestly, with the amount of pieces these break down into you really only need one figure to start having a lot of fun with builds. Yeah…"Remember those awesome toys from the 80's? Here's a tiny, two color brick that doesn't even really accurately capture the look of them!" 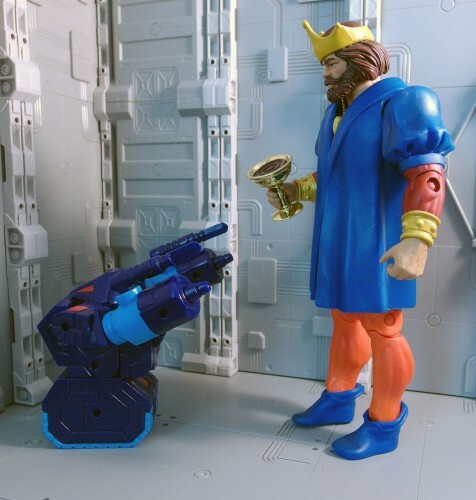 That doesn't strike me as being even remotely accurate based on my interactions with fans and the Glyos crew. It does amaze me how far out of their way some collectors will go to trash them though. How would you have brought them back? If you're ever at a con and we're there with these figures, be sure to stop by the booth. I'd be glad to know if your opinion was different seeing them in person. I can vouch for this. I was a little skeptical, but as soon as I had Enemy in hand, I was won over! I can't overstate that tactical joy and imagination these these toys can bring out in you. Actually I'd argue that these new designs evoke the original pretty darn well. And it's not like the vintage toys are impossible to find if collectors want that. Instead of just recreating what was already done the Toyfinity crew are breathing new life into a toy line that was kind of left for dead a long time ago. Why not take that opportunity to do something different with it? Also, sure, there might be plenty of douches in the community, but have you met or interacted with John or Matt? 'Cause I've found them to be super nice and very generous guys so insinuating that they aren't seems kinda low. Not saying you have to love these toys, I get it they're not for you, but man, no call for that assumption. Just my two cents. Well, their shills got their backs looks like so they got that going for them. Actulaly thats pretty much exactly how most of these independent toy guys operate so they don't seem to different. No shills here – you have the head of the company. Do you like the figures? Ahhh toy collecting. People say they like something and they're labeled shills. Bravo! I can assure you I'm no shill. I've even been a little (too) hard on these toys in the past. I am really that impressed! I think these look great, I'm just waiting for a colorway I really like. I'm far more interested in stuff like this than product that companies like, say, Mattel put out, "low articulation" or not. 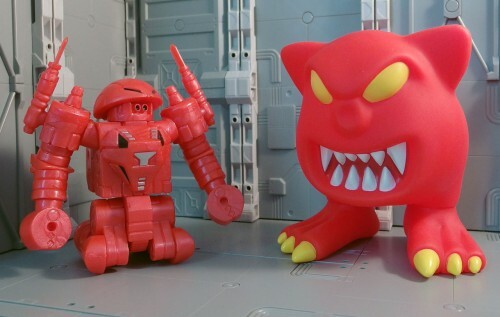 Okay…somebody really needs to make a legit recreation of Nazgar the Tyrant, as he actually would have been produced in the original Robo Force line. That figure is amazing. 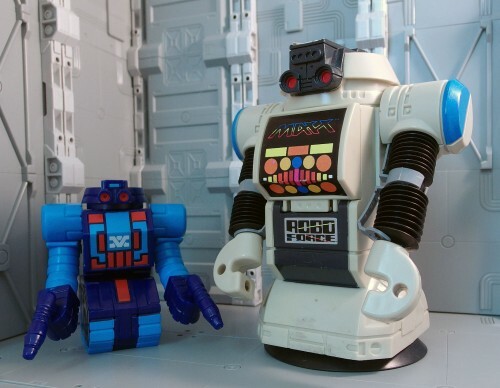 Doc, at one point you mentioned the possibility of larger vinyl (I think..) Robo Force figures that would match the originals in size. Is this still happening? And is the idea behind this to produce some of the canceled figures from the original series? Yes, this is still in the works. The push for 2014 is Manglors and something brand-new in the Mordles line. I definitely understand these not being for everyone, I for one love them. I've had too much fun taking apart and rearranging them into new robots. Yeah, can't wait until the next releases in March! I want more parts to mix and match.